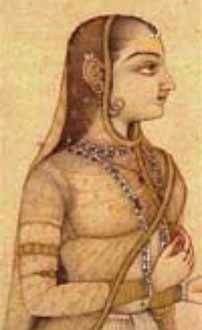 Rani Tarabai, or the (dowager) Queen Tarabai, was the wife of Chatrapati Rajaram Maharaj, and the daughter-in-law of the great Chatrapati Shivaji Maharaj. Thanks to her father's upringing for her and the fact that she was well versed in the art of warfare, Tarabai herself planned and supervised military expeditions. In 1705, Nemaji Shinde entered Malwa (Madhya Pradesh) and ravaged it while Khanderao Dabhade raided Mughal territory as far as Ahmedabad (Gujrat). In 1706, Ramchandra Bavdekar bribed the commandant of Fort Panhala and it was passed on to the Marathas (as was Pawangad). Parshuram Trimbak and Annaji later retook Satara and then Parali. Shankar Gandekar retook Sinhagad, Torna and Rajgad. Dhanaji Jadhav, the commander-in-chief, led many expeditions against the Mughals, along with other able Maratha commanders such as Udaji Pawar and Haibatrao Nimbalkar, and caused serious damage to the Mughals. Aurangzeb too had aged. For a man rarely accustomed to failure, he had to bear the ignominy of repeated failures and a string of bad news reports coming from Maratha territory. In 1707 (at Khulatabad near Aurangabad), Aurangzeb, the Mughal emperor, died a bitter man. After Aurangzeb's death, the Mughals (under Prince Azam) released Prince Shahu, the son of Sambhaji (and grandson of Shivaji) from their prison. The idea was that Maratha ire against the Mughals would be alleviated and also that there should be an element of dissension in the Maratha ranks, leaving the Mughals free to fight their own succession battles (between Prince Azam and Shah Alam, Kambaksh etc). Tarabai however refused to acknowledge Shahu as the real king and insisted on her son becoming her successor. She even called Shahu an imposter. But with Shahu's arrival, many Maratha commanders left Tarabai's side and joined Shahu. They felt Shahu being the son of Sambhaji was their natural ruler (and Rajaram and Tarabai were only temporary rulers in the absence of the real king). After a few unsuccessful battles and facing the regular desertion of her closest aides, Tarabai accepted defeat and reluctantly agreed to accept Shahu as the rightful king of the Marathas. Magnanimously, Shahu also allowed his aunt to retire to the province of Kolhapur, where she set up her independent throne in 1713. Tarabai outlived her son. After the death of Shahu in 1749, Tarabai supported the succession of Ramraja (Tarabai's putative grandson and later adopted by Shahu) to the Maratha throne. Through Ramraja, she tried to exercise control over the affairs of the Maratha kingdom. She even tried unsuccessfully to remove the Peshwa Balaji Bajirao from his post, as she found him an impediment which was challenging her power. Later, finding Ramraja difficult to control, Tarabai imprisoned him. There was a brief power struggle between the Peshwa Balaji Bajirao and Tarabai. But eventually the power of the Peshwas prevailed. The old queen agreed to a compromise whereby she would accept the power of the Peshwas, leaving them in sole control of the Maratha kingdom. In return the Peshwa would allow Tarabai independent control over her principality. Also, Tarabai was to declare that Ramraja was not her grandson, as she initially claimed, but an impostor she had used to succeed the childless Shahu. Ramraja remained Tarabai's prisoner to the last. Tarabai died in 1761. Even though Hambirao was the brother of Soyrabai, he had supported Sambhaji raje in the power struggle for the Maratha throne against his own sister. After the death of Rajaram, his widow Tarabai took over the reins of power and continued Maratha resistance against the Mughal onslaught led by Aurangzeb himself. She offered much-needed leadership to the Maratha army when it was vitally required. Tarabai had imprisoned Rajasabai and her son, Sambhaji (the other wife and son of Rajaram, contenders for the throne) so she could gain power herself. Raja Karna, her illegitimate son, had earlier been placed on the throne by Dhanaji Jadhav and other ministers, but he died of smallpox within three weeks.